The new JENSEN® Portable Bluetooth® Wireless Speaker can go where you go! Experience size-defying sound and incredible features with the JENSEN SMPS-621. Use it as a wireless speaker for your Bluetooth-enabled phone and be amazed as this speaker provides support up to 33 feet away. You can even take your calls wirelessly using the hands-free speakerphone feature. Don’t have your Bluetooth device handy? No problem, just plug your iPod®, MP3, or other digital audio player into the auxiliary input jack and take advantage of that same great sound. The SMPS-621 features NFC for easy Bluetooth pairing and contains a built-in rechargeable battery so you don't have to worry about the added cost of buying batteries. Choose from not one, not two, but three awesome colors: Blue, Red, and Silver. 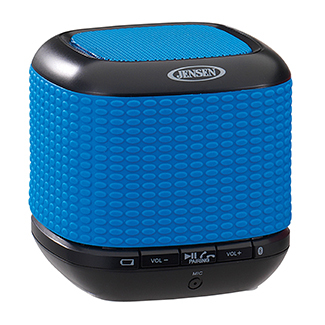 Take your music on a hike, to the beach, or anywhere you travel with this remarkable new product.